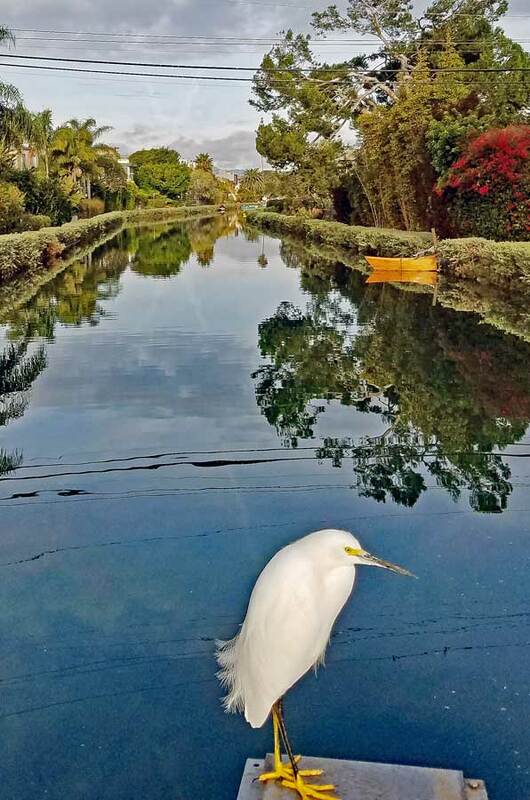 Snowy Egret waiting for prey at Grand Canal, Venice of America. The snowy Egret with it’s magnificent white plumes was an endangered species at the beginning of the 20:th century because of the fashion industry that was using the plumes in their creation of hats and clothing. Due to early conservationists rallying to save the species it is now again thriving in the coastal wetlands. The big yellow feet are used to stir up small aquatic animals from the bottom. The giant sandbags that were in place during the relining of the culverts for the water to flow under Washington Blvd has now been removed and the birds have had to find other perching places to study the water for prey.